One vegetable combination I see at restaurants all the time is a mix of carrots, string beans and usually a green and yellow zucchini. Zucchini isn’t my favorite, and is a summer vegetable, so in the winter/Spring I skip the zucchini and just focus on the beans and carrots on their own (saves me the trouble of picking out the zucchini which I avoid anyway). I had a bunch of shallots in the pantry, so I sauteed them in butter and mixed with the vegetables to elevate the flavor. 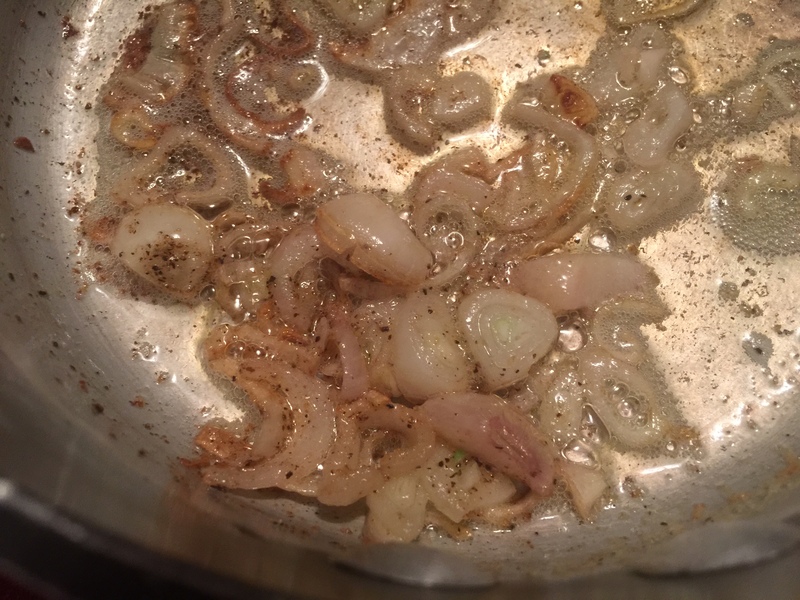 I love shallots, they are sweet like an onion but as rich as garlic. Clean, peel and cut the carrots into angled chunks. Clean and cut the string beans in half also on an angle, while removing both ends. Tip: Officially you are supposed to remove the end where the bean attaches to the stem and leave the other side in tact. Who has time to figure out which to keep and which to cut? I would rather cut both sides off! Pour 3 cups of water in the bottom of a steamer pot and put over high heat. While the water is heating up, clean and slice the shallots and add them to a small pot with the butter and cook over medium high heat. Salt the shallots generously so that you pull the water out of the them and provide enough salt and pepper to season the beans/carrots properly (half a teaspoon salt and 1/4 tsp pepper). Cook until tender and just slightly browned. 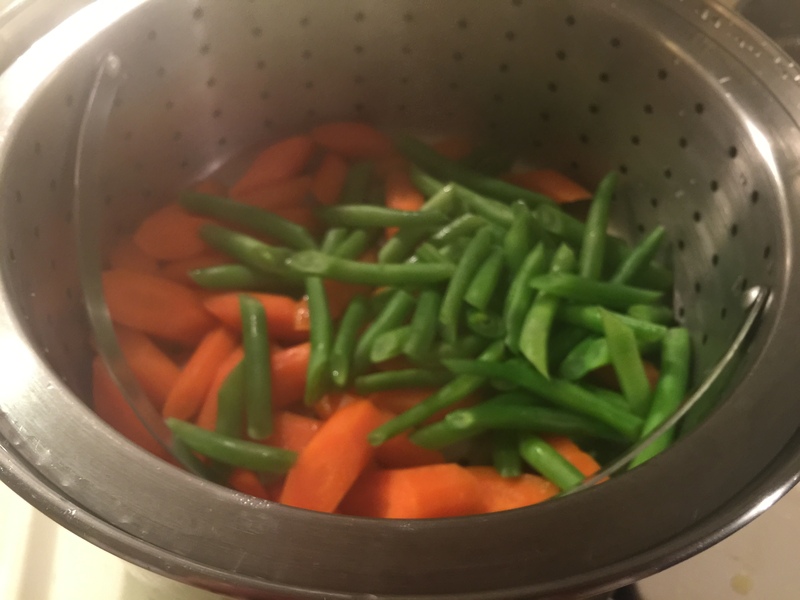 Put the carrots in the steamer basket and cook for 3 minutes with the lid on of course. Add in the beans, put the lid back on and cook for another 4 minutes and check by tasting a bean. You want both the beans and the carrots tender, but you don’t want the beans to lose their nice bright green color or turn into mush! At the last minute pour in the butter and shallots and mix through the vegetables. Taste for seasoning and adjust. Pour into a large serving dish and hit with a little more salt and a bit of pepper on top. 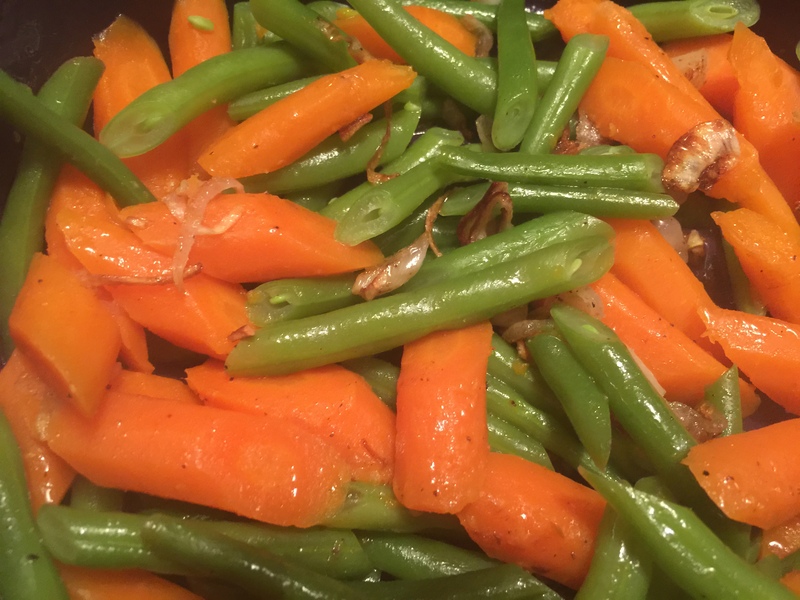 Another way to season the string beans and carrots would be to add a tablespoon of garlic butter!